We provide all types of fasteners from standard items such as Plastic Bolts, Screws, Nuts, Washers, Spacers, Threaded Rod, Plastic Industrial Balls to intricate parts per print. 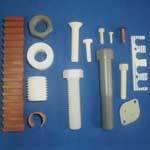 Our plastic and nylon fasteners are made of non-metallic materials including acetal, polycarbonate, PVC and polypropylene. From prototypes to production we machine all kinds of metal fasteners to metal stud fasteners to non-threaded metal fasteners. E & T Fasteners offers a complete line of engineered molded plastic fasteners and machined metal fasteners. We take pride in offering exceptional service, remarkable pricing, and lead times that can't be beat. 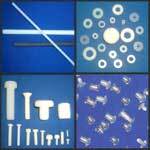 Our staff has extensive experience in the plastic fastener and component industry. Need technical assistance? We can help. We're committed to being on the cutting edge of what's new in the industry so you'll never deal with an inexperienced clerk. With networked fastener operations in on both the east and west coast of the United States, we're there when you need us regardless of where you placed your plastic fastener or plastic component order &dash; in the United States, Canada, or internationally. 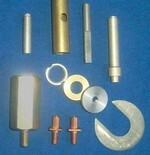 E & T can machine precision custom plastics fasteners and metal components to your specifications. Don't have a drawing? In most cases we can create a drawing from your sample. Every person on our engineering staff is committed to delivering you with the highest quality metal or plastic fastener and component product in record time. Plastic and Metal Fasteners / Components include: Plastic Screws - Bolts - Nuts - Washers- Threaded Rod - Plastic Push In Fasteners - Plastic Balls Industrial - Seals - Bushings - Spacers - Plastic Post & Screws, Hole-plugs.